A theme for ECF in the Mars SR Cycle has been the creation of new Tooling to support development, debugging, and deployment of ECF Remote Services. This ongoing community effort includes in this release a new Remote Service perspective. Once the Remote Service perspective is opened, it shows the new Endpoint Discovery view (lower left). The Endpoint Discovery view will be dynamically updated to display Endpoints that have been discovered via network discovery (i.e. using ECF-supported network protocols like zeroconf, slp, zookeeper, dnssd, etcd, or custom). 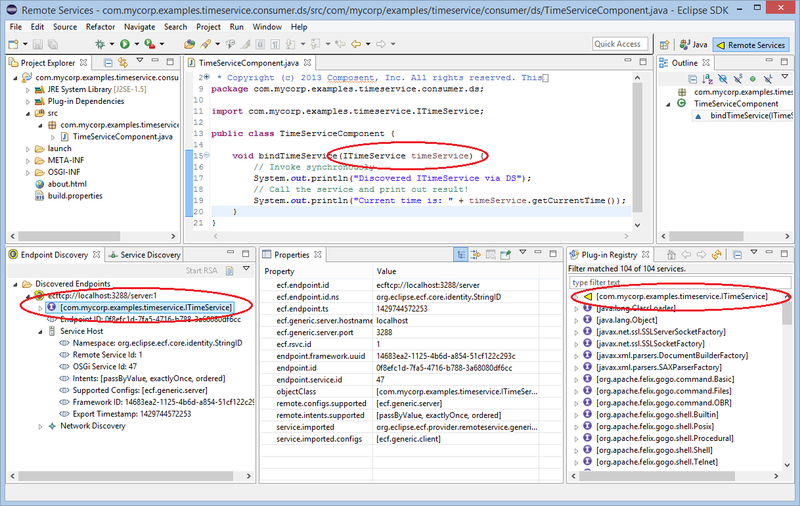 To the right of the Endpoint Discovery View is the Eclipse-standard Properties view to display the properties present in the selected Endpoint. 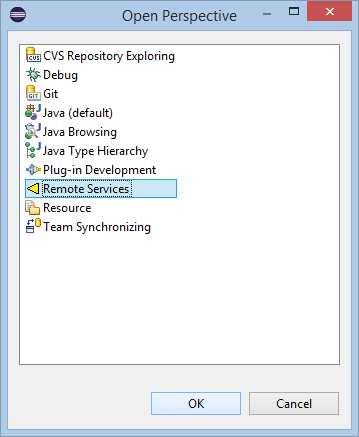 To the right of the Properties view is the Eclipse-PDE-provided Plug-in Registry, which can be used to show Remote Services that have been imported. 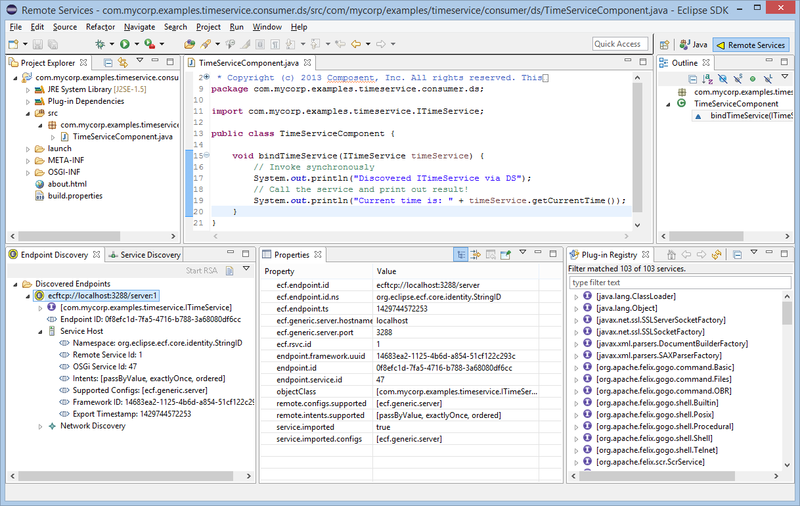 Note that the Plugin-Registry defaults to grouping the presentation based upon Plugins rather than Services, and so should be set to Group By/Services view the view menu to display the OSGi Services currently active in Eclipse. Discovered Endpoints can be Imported into Eclipse by opening the Endpoint's context menu. Importing the Endpoint means that ECF creates and locally registers a proxy for the remote service, allowing application code to actually use the remote service (call it's methods). As shown below, the Plugin Registry and the Endpoint Discovery view are graphically updated to show that the Remote Service is currently active in the Eclipse Framework, and that the Endpoint has been imported. ECF provides a compliant and CT-test implementation of OSGi Remote Services and Remote Services Admin. In OSGi R6 specification work done in early 2014, the Enterprise Experts Group (EEG) made additions and some small changes to the Remote Service Admin specification (v1.1). Remote Services is specified in Chapter 100 of the enterprise specification, and Remote Service Admin in Chapter 122 of the specification. You can download the R6 enterprise specification at the OSGi web site. With this 3.9.0 release, ECF's implementation is fully compliant with the OSGi R6 Remote Service and Remote Service Admin (1.1) specifications. This includes testing against the OSGi R6 Compatibilty Test suite for remote services/remote service admin parts of the specification.